For something as simple as a gift card holder I cannot believe I used so many different supplies!! I started with an idea I found on Pinterest that did not lead to an actual web page (grrr!) so I can't give credit. If you know who designed this, please let me know so I can give them credit. Don't you just hate it when Pinterest takes you to just an image with no details? Red Cardstock - Recollections - cut at 3.75" x 11" and scored at 3" and 7.5"
Gift Paper - The Paper Studio (Hobby Lobby) - cut at 2.75" x 3.5"
I told you it was a lot of supplies!! I also used my awesome CutterPillar and my Big Shot (with both my extended plates and my magnetic plate) so I pretty much used all my tools except for my Cameo or Cricut. 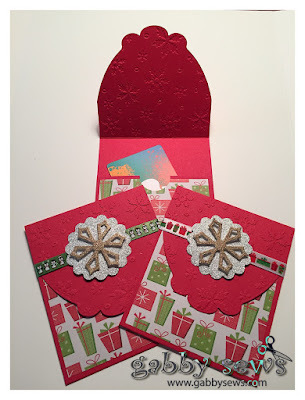 Although the original plan for these gift card holders did use a cut from the Art Philosophy Cricut Cartridge and a CTMH stamp set but the tags I created just didn't fit these holders so they will get used on Christmas presents under the tree instead. I'll try to get some pics of those and post the info.